Sarsfields GAA club in Newbridge has been allocated just fifteen tickets for Kildare’s All-Ireland qualifying clash with Mayo after the tie was moved to Kildare’s home ground of St. Conleth’s Park. The match-up was originally scheduled to take place in Croke Park due to concerns that St. Conleth’s Park would be unfit to host the game, but it was moved back to Newbridge after Kildare GAA announced they would not be participating if the tie was held in Dublin. Kildare manager Cian O’Neill had described the decision to play the game in Croke Park as ‘bewildering’, and said his side was entitled to enjoy the home advantage they were given when the draw was made. The GAA backed down on the issue following the backlash and said Saturday’s game would instead take place in Kildare’s home ground. The 8,200 capacity in St. Conleth’s Park causes problems in its own right however, as all of Mayo’s 3,500 season ticket holders are entitled to a ticket, meaning only 1,500 tickets will be distributed to clubs in Kildare. 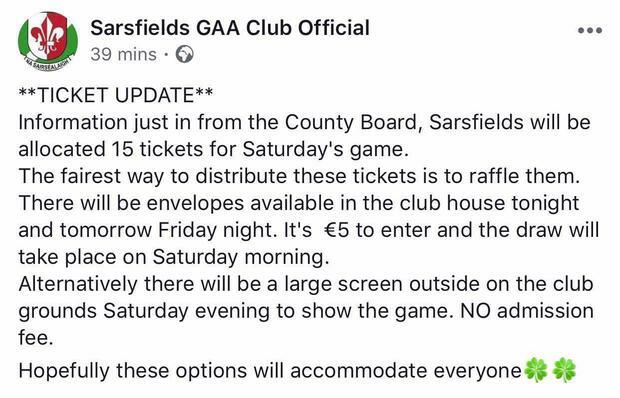 In a post on Sarsfield GAA’s Facebook page, the club revealed that they had been allocated just fifteen tickets for the All-Ireland qualifier, and said the tickets would be distributed through a raffle. “Information just in from the County Board, Sarsfields will be allocated 15 tickets for Saturday’s game,” the statement read. “The fairest way to distribute these tickets is to raffle them.